Features bi-fold doors with seedy glass panels, beadboard interior back, and 2 adjustable shelves. As this unit is intended for use with media components, the upper back panel is drilled for wires. 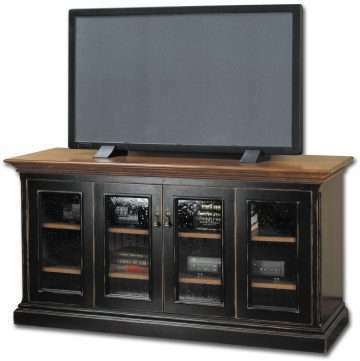 This unit coordinates with our HFS40-Hillsboro Flat Screen TV Wall-Mount Cabinet. Ships in 2 corrugated cartons (1 cabinet-100 lbs, 1 shelves-35 lbs) on 1 wooden pallet (50 lbs). Unboxed Weight: Cabinet 83 lbs, Shelves 23 lbs.